We’re coming off the heels of a Pantry Challenge. As such, my cupboards are pretty bare. The freezer, too. I look forward to restocking both. FishPapa and the boys are going to help me fill the freezer. As for the pantry, I’m looking to replenish some of the staples that I lean on. 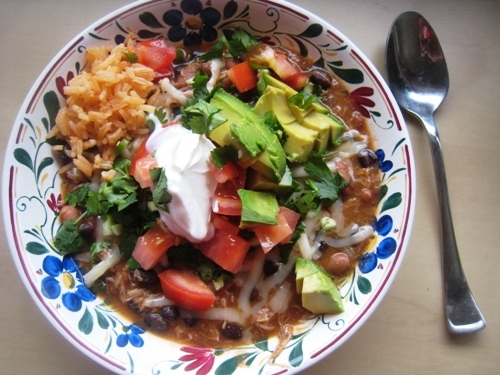 Items like diced tomatoes, beans, tomato sauce, salsa verde, tuna, hominy, sweetened condensed milk, and coconut milk are pantry staples for me. If I’ve got a cupboard stocked with those items as well as rice, pasta, and some fresh fruit and veg in the fridge, I’m good to go. I am not afraid to buy a whole flat of beans at Walmart or one big multi-pack of tomatoes at Costco since I know what a help those canned items are to me when I’m in a pinch. Canned goods are, in fact, an integral part of a frugal pantry. A pantry well-stocked with favorite canned goods can help you save time and get a healthy, home-cooked meal on the table, more often. I have several meals, those ones to make when there’s “nothing to eat” that rely heavily on canned beans and vegetables. Cans can make homemade a little easier, especially when your other plans fly south. Not that I would know about that. This past month, we’ve spent a lot of time talking about not letting food go to waste. One study shows that a lot of us Americans throw away spoiled fruits and vegetables on average two times a week. Canning food can help make sure nature’s bounty doesn’t go to waste. 1. Determine what you really love. Years of doing the Pantry Challenge have helped me refine this list. If it sits in the cupboard languishing from disuse, it’s probably not a good buy for me. I still have the canned pumpkin I bought after the holidays in 2010. They expire this year. Time to get baking. Buy one of something to try; buy dozens of something you love. 2. Stock up when it’s on sale. Since I do so much cooking at home, buying in bulk works for us. It could also be that we have eight mouths to feed. Ahem. If I see a good deal on canned goods, I’ll buy a lot. For example, S&W canned beans were on sale at Ralphs back in January for $0.49/can. That’s about 40- 50% off the regular price in these here parts. I bought a lot. 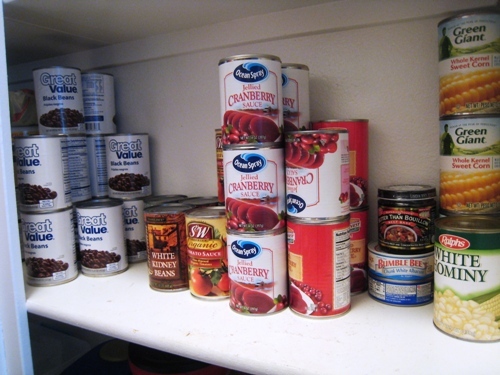 I put some in the emergency food storage which I’ll rotate out this fall, and some went into the regular pantry. They disappeared in a flash. I should have bought more! By buying a lot of something that I know we love (see rule #1), I save money and can keep a full pantry. It’s all about building a useful stockpile. Canned goods have a pretty good shelf life, but they do lose quality over time. I’ll be checking our emergency supply for cans to rotate out as well as using up that pumpkin. Ahem. Be sure to use your oldest cans first, so that you avoid compromising your investment. Check out this method for keeping track of your canned goods and rotating stock in a timely manner. “Cans Get You Cooking” is a program dedicated to spreading the message that the ironclad technology of cans seals in freshness, flavor, nutrition, and goodness so that you can create meals you feel good about serving and that your family will love. Do you have a favorite trick for keeping your cantry stocked? Disclosure: I have received financial compensation from the Cans Get You Cooking Campaign, through my partnership with the Mom It Forward Blogger Network. All opinions are my own. What Can You Make with Beans? I have a similar can of pumpkin. Today I’m using it to make pumkpin pudding and then taking it to knitting with some friends. For the pumkin, make pumkin muffins or pumkin chocolate chip muffins to put in your freezer. They are AWESOME! Then, when a muffin is needed–just pull out of the freezer and microwave for 30 seconds. Warning—your family would probably eat a double batch before they even get to the freezer! PS Money Saving Mom (the blog where I found you from years ago)—has a great recipe, if you need one. Thanks. I actually have a whole collection of favorite pumpkin recipes here: https://goodcheapeats.com/2012/10/fill-the-freezer-with-pumpkin-love/ I just need to get moving on the baking thing. If you aren’t looking for an actual pumpkin flavor, just swap out the pumpkin for the oils in your baked goods (or even do half and half) and the pumpkin will disappear in a hurry, plus make the muffins/cakes/cookies a little healthier. Since we are talking about canned goods, and we are coming off a pantry challenge, does anyone have any great suggestions for canned sardines? I had a dish I saw and made once, we loved it, I bought them in bulk, and then we got tired of that recipe. Now I’m stuck with these sardines and haven’t seen anything else that sounded great. I’d really like to get rid of them, though. One type of canned item that I dont think most people utilize enough is the large gallon size cans of vegetables ,fruit, tomato sauce , ketchup & puddings. When I was raising my kids back in the 80s, money was extremely scarce and I would often buy giant cans and divide them into freezer containers, freeze, and use them as needed. I payed less than half what I would have paid if I were buying the same things in single serving cans. I havent bought any in a long time but Im willing to bet that the gallon cans especially at a wholesale club would seriously slash the cost of most if not all of the items you can find in these jumbo sized cans. I too love to use canned pumpkin for our favorite pumpkin bread recipe, but I also like to keep it on hand as a thickener for soups and stews. It’s delicious in vegetable soup or beef stew! This is the perfect time of year to stock up on nutritious foods. 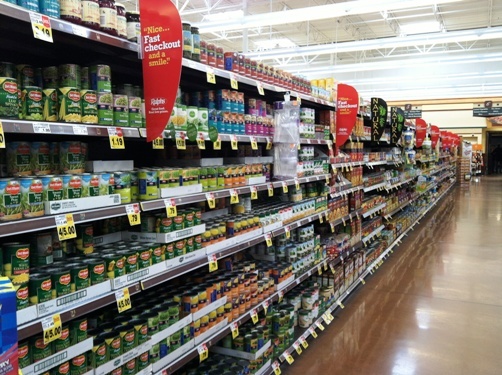 Because the holidays are near by, the canned goods isle is going to be screaming with sales.